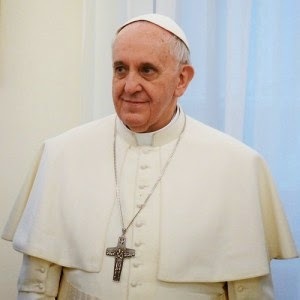 77 year old Pope Francis (Jorge Mario Bergoglio) , born in Buenos Aires, Argentina, is scheduled to visit Israel on May 26th, which is an important event. He is the 4th Pope to visit what Christians call "The Holy Land" of Jordan, Palestinian Territories and Israel and will do so in his 3 day visit which for him starts on Saturday the 24th.. There will be live streaming of the visit. Many countries that are Catholic majorities will be interested in this, such as the USA, Brazil, Italy, Spain, Poland, Germany and France. Israel's Tourism Ministry is very interested as they are investing about $2.9 million dollars in marketing for the visit of the Pope. Last month a campaign was on going where people were asked to upload a 15-second video on why they wanted to visit the Holy Land. Gustavo Aldolfo Franco Picaza from Venezuela won a free trip to Israel with his winning video. Hundreds of journalists will cover the Pope's visit. "He is a visitor of the highest importance", stated Minister Dr. Uzi Landau, Israel's Tourism Minister. Israel spends a lot of shekels on Christian sites. Christian tourism brings about 60% of tourists, and this visit should increase that number. Out of Israel's population of 8,134,100, 2.0% are Christians or 155,100. "Argentines in Israel are the largest immigrant group from Latin America and one of the fastest growing groups. The vast majority of Argentines in Israel are Jewish Argentines who make Aliyah but there is also an important group of non-Jewish Argentines who choose Israel as their new home. There are about 50,000 Argentines residing in Israel although some estimates put the figure at 70,000. Most Jewish Argentines are Ashkenazi Jews." Considering that Christian groups are highly involved in the BDS movement against Israel like the Presbyterians, this is a positive event for Israel, so the thought that the Pope will recognize Palestine and call for an end to occupation is a huge disappointment and stab in Israel's heart after whizzing through in 3 days. The PA (Palestinian Authority of Abbas) and the Arab Christians probably led by Sabeel are already celebrating Pope Francis's visit to their territory which starts this coming Sunday as a visit to end "occupation.". The Pope evidently has already decided on starting his trip with going to Bethlehem, which is held by the PA and is a sign to them of recognition. Whereas Bethlehem used to be populated by all Christians, it is now 2/3 Muslim. This piece of information comes from Father Jamal Khader of the Latin patriarchate in Jerusalem. Information of starting in Bethlehem comes form Rabbi Sergio Bergman of Argentina and close friend of the Pope who said that he intends to define himself as the "Che Guevera of the Palestinians" and support their "struggle and rights" during his visit. He plans on traveling in an open car in Bethlehem and meet with Abbas and hold a "mass" prayer services there instead of in Jerusalem to show support for the PA. Then he plans on visiting the Dheishe refugee camp to see them suffering. Palestinians have been in such camps since 1948, and are the longest people to stay in such camps. The surrounding Muslim countries do not accept them in any state of being except as refugees in camps. Christians have been violently persecuted in Bethlehem by the Muslims who have taken over Bethlehem, but the Pope has not said a word about it. This is turning out to be a highly political visit as the Arabs see it. The Pope will lunch with Palestinian families who have suffered from the occupation. The Arabs are delighted that this visit is to Palestinian sites first and see it as a slight to Israel. Besides visiting PA-controlled areas, the Pope plans to visit Arab-populated neighborhoods of eastern Jerusalem. He will later visit with Prime Minister Binyamin Netanyahu at the "Vatican-owned Notre Dame complex located between Jewish and Arab neighborhoods. There the Israelis hope to explain their point of view of political events in the region. Since the Arabs keep pushing the idea of Israel's "occupation," which they are stressing, Netanyahu will have to address much background and history in about a half hour. What he wants to address the most is to explain the Iranian threat to Israel. The question remains about his visiting in Gaza. After all, Fatah and Hamas are united these days, so does he dare go there? That's an area not very friendly at all to Christians. In 2005 it was estimated that there were about 5,000 Christians living in Gaza. The Greek Orthodox Church is also a main branch of Christianity in Israel and the 2 groups have not always been friendly with each other. "Francis will meet the patriarch of Constantinople, Bartholomew, regarded as the “first among equals” in the Orthodox world, and for the first time in the Holy Land the two leaders will preside together over a public prayer. The encounter recalls a famous 1964 meeting between Paul Paul VI and Patriarch Athenagoras of Constantinople, which led to lifting excommunications born of the feud between Eastern and Western Christianity and that date to 1054.. "
Councilman Aryeh King is not planning on attending an official welcoming of the pope unless he has packed in his suitcase all the treasures of the Jewish people stolen by past popes known to be stored in the Vatican's basement. That's not going to happen, so he won't be in attendance. The "Last Supper Hall' is located at the complex of King David's Tomb. Christian services are held there at the complex once a year. Christians are disappearing in the Middle East. They've gone from making up 26% of the population to 10% in the Middle East. "In the rubble of Syrian cities like Aleppo and Damascus, Christians who refused to convert to Islam have been kidnapped, shot and beheaded by Islamist opposition fighters. In Egypt, mobs of Muslim Brotherhood members burn Coptic Christian churches in the same way they once obliterated Jewish synagogues. And in Iraq, terrorists deliberately target Christian worshippers. This past Christmas, 26 people were killed when a bomb ripped through a crowd of worshipers leaving a church in Baghdad's southern Dora neighborhood." The only country they are safe in is Israel. I imagine that the Pope will attack this only state protecting Christians in deference to the Palestinians who have done quite a number on them already in Bethlehem. After all, it's a Jewish state, and everyone attacks Israel for their own imagined reasons. The sun and stars will move in heaven when someone of importance stands up for Israel. For Pope Francis' visit to Israel and the Palestinian Authority next week, the PA has commissioned an art exhibit that includes works of art portraying Palestinians as Jesus. This is pretty typical of the Palestinians: to mix their history as they see it with Jewish history. There they've done is visually with historic paintings and adding their touch. They're counting on people to not know their history and the fact that there were no Palestinians in the days of Jesus other than Jews under Roman rule at the time. There never has been a country called Palestine; only a renamed land by the Romans who created this name.